Often called ‘warm-up suits’, tracksuits play an important role in an athlete’s sports kit by helping her or him warm up before and between games. Worn as a cover up over the regular sports clothing, tracksuits not only ready the body for performance, they also help the athlete to find their mental discipline through focus so that they deliver their best on the field. With time, tracksuits have evolved from just being something to wear over jerseys, to delivering warmth, breathability and a natural range of motion as athletes work their way through practice drills. 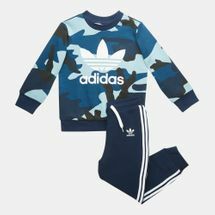 Give kids the head start they deserve with a tracksuit - a sports kit essential, tracksuits for kids help young athletes by honing their minds to ensure they deliver all they’ve got while they play their favourite sports. By keeping them warm, tracksuits allow kids to warm up the right way before a game. Drills, jogs, sprints and stretches in a tracksuit not only keep the muscles warm but also help to prevent injuries. 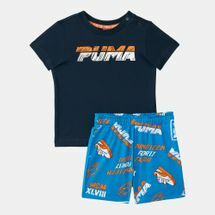 Your kids’ sportswear should also keep them looking great every time, which is why these tracksuits are designed keeping a modern athletic aesthetic in mind so that your little ones look sporty every time they are in one. 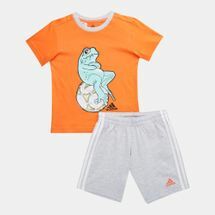 Get your young champs to deliver their best with the right tracksuit; specially designed tracksuits for boys and tracksuits for girls combine style with functionality so that kids not only practice right but also stay trendy on and off the field. 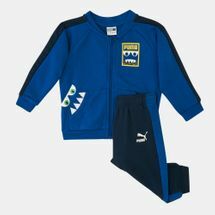 Pick from the world’s most trusted and loved sports brands when you choose your next kids’ tracksuit. Browse through the latest collection of kids’ tracksuits online at Sun & Sand Sports and place your order today to have it delivered to your doorstep in Riyadh, Jeddah and the rest of Saudi Arabia, KSA.